When my first child, Theo, was two months old, two contributor’s copies of a journal in which one of my short stories was published arrived in the mail. Josh and I had just spent the afternoon at the doctor’s office, convinced something was wrong with our baby because he cried and screamed for hours each day. He was pronounced healthy — a relief. But colicky — not a relief. By that evening, I was so frazzled and anxious that I couldn’t be in the same room with Theo. Josh took him to the other end of the house and closed the door, and I looked for some way to occupy myself so that I wouldn’t just sit alone and cry. The manila envelope was sitting on the coffee table, unopened amidst all the chaos, my name — not Mommy, as others suddenly addressed me, but my actual name — printed neatly on the label. I opened it carefully and held the two glossy, thick journals in my hands. A few weeks after Theo’s birth, I was seized with the fear that if I didn’t start writing again soon, I was going to end up as one of those writers who had potential but allowed life to steal it all away, someone who just stopped and never wrote again. Between breastfeeding and rocking the baby to sleep, in the brief few minutes before he inevitably woke right back up, I struggled to put together a little eight-page story, a statement: I am still a writer. But it was much harder than writing had ever been for me. And I didn’t see how I could replicate the effort again and again, constantly interrupted, sentences hanging off the tip of my tongue until they just… vanished. 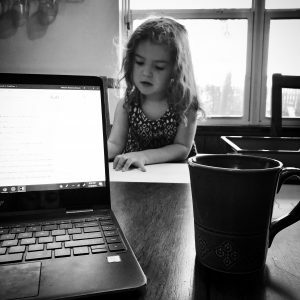 By the time we understood we had a colicky baby on our hands, I had already resigned myself to taking a break from trying to write so I could focus on mothering. So, when those journals arrived, I couldn’t help but see them as relics from an old life, one not so far past when I counted up the weeks, but one that seemed years away, a wholly separate life that felt less and less like it was ever actually mine. I found my story in the fresh, smooth pages and read it from start to finish while Theo’s muffled cries eventually quieted. Pride bloomed open in my chest. Half a year after its acceptance, it was still some of my best work. But my pride quickly wilted as a painful thought took root: This might be the last story I ever publish. I would tell myself that there would be a chapbook, a poem, several essays on fresh pages like those. There would indeed be some more short fiction published and a novel to work on. Several old manuscripts to revise when new material didn’t cooperate. (There would even be two more children.) And there would be new art that I hadn’t fathomed – embroidery, drawing, sewing. My process would have to change. My expectations, too. But this was not the end, not at all. 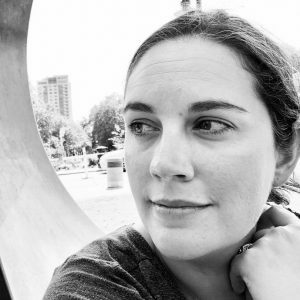 From my experience as a mother who writes – or, depending on the day, a writer who mothers – I have created a workshop for moms and nonbinary parents who feel the powerful call to create. 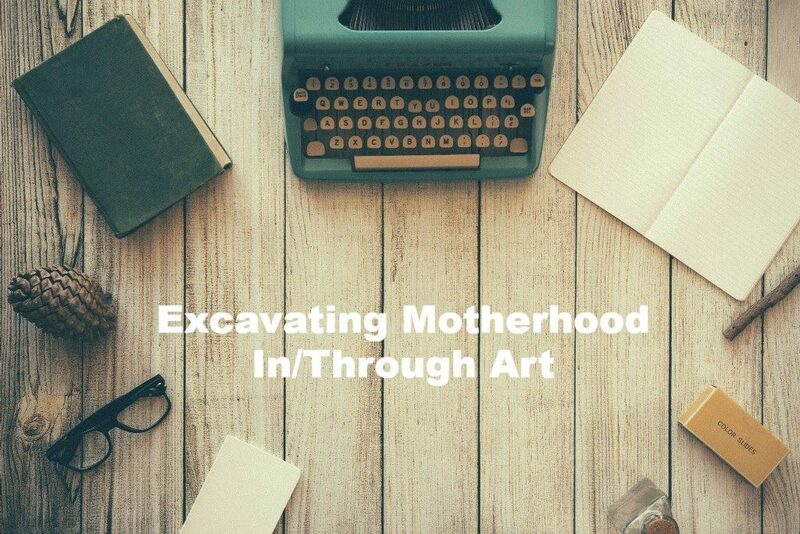 Excavating Motherhood In/Through Art is a ten-week online course that will interrogate the intersection of mothering and making. 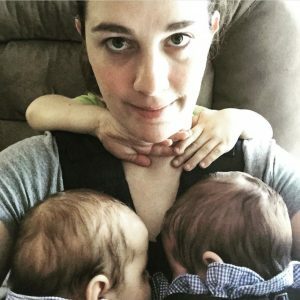 Each week, we will focus on a particular topic, ranging from the logistics of balancing these two important parts of our lives – creating the space and time for our art within the realities of care-taking – to deeper questions about identity and value and what it means to us to be both an artist and a parent. An important aspect of this workshop will be the supportive community of like-minded people who not only relate to the struggles of raising children like your other parent-friends, but also understand the need to be deeply engaged with your creativity. That particular intersection of a parents-and-artists Venn diagram is difficult to find in every day life, so we will make it ourselves. Our private Facebook group will allow us the space to make meaningful connections with other artist-mothers, voluntarily share our work, soundboard and troubleshoot ideas, and provide and receive gentle accountability. Additionally, once a week, we will have a scheduled video chat on Zoom to talk in real time about that week’s special topic. You will receive supplementary materials – articles, videos, spotlights on specific artists, etc. – to help you dig deeper and enhance our conversations. What would a workshop for artists and writers be without some inspiration? You will receive hands-on exercises each week that are designed to help you enter or re-enter your work from a new vantage point. 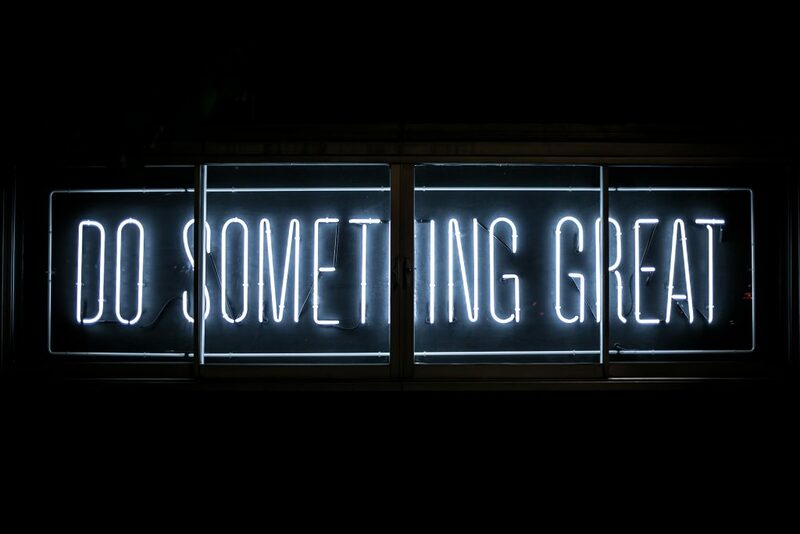 Many of these will be writing exercises, either directly applicable to a manuscript in progress or more tangential – writing about your work, your process, or your identity – from which to draw inspiration. Other exercises will be more generally useful across many creative disciplines. They will all be tied to our overall theme of motherhood, but the work you produce during this workshop is entirely up to you. By no means must you center mothering in your work to get something out of this course or to share your work with the group. 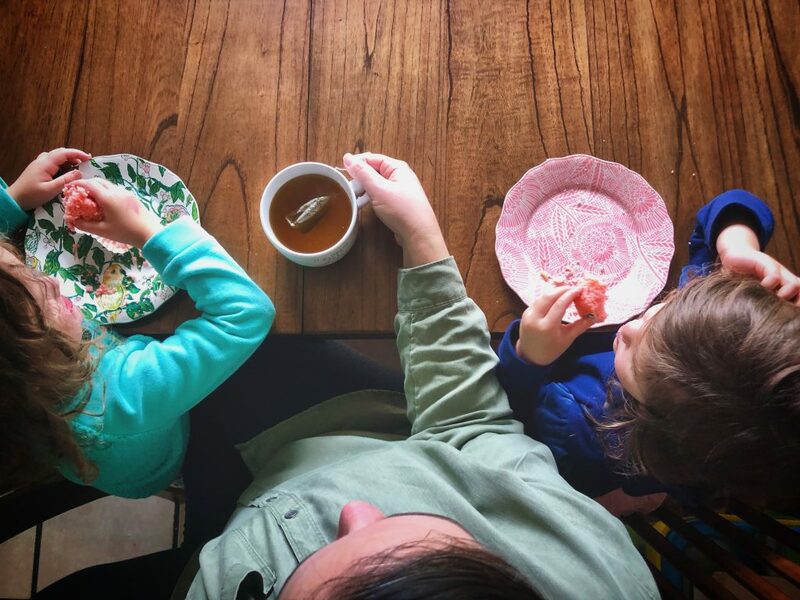 Whether you’re a first-time mother with an infant or a seasoned parent with older children, there always seems to be a regression or a difficult stage or some other new challenge that convinces you to hold off, to not prioritize your art just yet. Like deciding to have children in the first place, there’s never a perfect time to commit or re-commit to your creative vocation with children. Your family will always need you. But you know what happens when you deny your creativity an outlet. Frustration, resentment, impatience and irritability, maybe feelings of mourning. Because being an artist is more than a superfluous hobby. It’s part of your identity and likely has been for awhile – long before you became a parent. If you have been serious about your art in the past, it can be painful to let it go for even a temporary period of time, even if you feel strongly about the value of being present with and available to your family. Your creative life most likely is not your primary job. Maybe you make minimal or no money at all from your work. Maybe you haven’t been published or you don’t have a very large following. The world is not demanding that you make art. There are a million other responsibilities, those that do make money to support your family and those that have obvious inherent value, like keeping your children alive and fed and safe. How do you justify spending some of that time on a pursuit that feels like it is mainly valuable only to you, or that won’t even be shared with the world for many weeks, months, even years of work? When you begin a creative project, you feel excited and energized, purpose-driven. You know you’re doing what you were meant to do, creating from a part of you that almost trembles with the desire to be concretely realized and shared with the world. Completing a piece of art gives you profound satisfaction, a sense of accomplishment and competence at something (perhaps in contrast to the on-going, never-easier-just-different challenges of parenting). And when it is received warmly by others, you take that validation in, fuel your next project with it. You trust in the process. You harness hope. There is even, sometimes, a bit of magic in the making of art, like you are somehow straddling two worlds at once. Whether your creative rhythm involves a lot of magic or a lot of deliberate work, the act of creating itself, regardless of the outcome, matters a great deal to you. Maybe you don’t know where to start. Maybe you worry that you’ll feel guilty about reclaiming your time, your space, a sliver of the life you didn’t mean to sacrifice. Or maybe you’re even afraid – what if you’re too out of practice, or you have nothing to say, or it brings up more frustration than it is worth? What if it stirs something powerful in you and, now, being pulled in so many directions will feel even more intolerable? What if you find that, as soon as you give your creativity an inch, it demands a mile? Are You Waiting For Someone to Give You Permission? Let me be that person who not only tells you it’s okay but wants you to reconnect with your art. I want to see what you could create if only you could figure out the logistics. I am asking you to make the thing that only you could make. And I’m going to help you work out how to balance your priorities so that, no matter what stage your kids are in, no matter what other challenges pop up over the years, you have some strategies and tools to protect your creative life. You don’t have to wait to do this. As soon as you sign up, you’ll gain access to the private Facebook group, where you will get to know like-minded people who want to support and encourage you. In week one, we will tackle the practical barriers you face so that you can create a personalized plan for making time and space to create. As you work through the exercises and engage in our special topic discussions, you’ll have opportunities to think differently and more deeply about your identity and your craft, opening potential new doors into your work. By the end of the course, you will have been given several avenues in to meaningful exploration of yourself as a mother and an artist. What you turn up in that exploration will serve you in the future as you continue to create and to set personal priorities, goals, and boundaries. The tools of this excavation — the exercises, special topics, strategies — also lend themselves to repeated use and adaptation. You can return to them to guide your continued work on your motherhood and your art, or you can put them to use interrogating other subject areas that interest you. You get to keep all course materials after the workshop ends. Previous workshop participants have shared that they continue to find areas they didn’t fully explore during the workshop and bring new perspectives to the material as they’ve entered new seasons in their parenting and art. We will end the workshop with a virtual reading/art show, a chance for you to share something you’ve created during the workshop. But that won’t be the end of the group and the relationships you build within it. You can stay in the group as long as it exists. Excavating Motherhood In/Through Art begins Saturday, February 16th and runs for ten weeks, until Saturday, May 4th. On February 16th, I will send the Week 1 packet, and our first video chat will be the following Saturday, February 23rd. 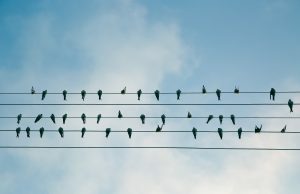 How will I access the online discussions and community? When you register for the workshop, you’ll receive instructions for joining our private Facebook group. The online discussions will be on-going and available for you to contribute to and read at your convenience. You can access it on your computer or phone. When and how will I access the video chats? Our live Zoom video chats will be held on Saturdays at 10am CST/11am EST. All Zoom chats will also be recorded and made available to the group, so if you can’t make the call, you won’t miss out on what we discussed. Participation in these chats is entirely optional, and although they are a favorite aspect of the course for most participants, those who could not attend the chats have still found the emailed materials and Facebook discussion useful. Zoom is free and can be accessed via computer or phone, whichever device you prefer. You’ll receive a link each week for our calls. Hi! I’m Melanie Sweeney Bowen. I’m a mother to a six-year-old son and three-year-old twin daughters. My first creative love is writing. I earned my MFA in creative writing from New Mexico State University in 2012. 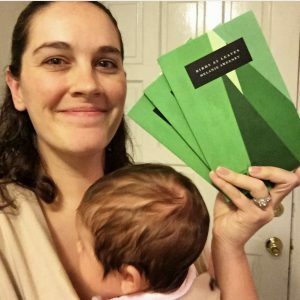 My chapbook on motherhood, nature, and the body, Birds as Leaves, was published in 2015 by The Lettered Streets Press. My fiction, poetry, and essays have appeared in Multiples Illuminated: A Collection of Stories and Advice From Parents With Twins, Triplets and More; The Dallas Review; Mom Egg Review; Rougarou; and more, including at Babble. 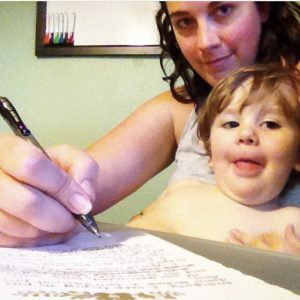 For two years, I contributed parenting- and creativity-related essays regularly for Cushy, a blog and community for womyn. My teaching experience includes formal instruction at Sam Houston State University and New Mexico State University, where I taught college composition, literature, and creative writing for six years. Outside of academia, I teach online and in-person workshops like this one as well as others on creative writing and journaling for authenticity. The intersection of creating and parenting is my favorite niche to explore. Additionally, I offer one-on-one creative coaching, including manuscript feedback, project sound-boarding, practical troubleshooting (the logistics of establishing and maintaining your creative practice), and general encouragement. My other creative interests include contemporary hand embroidery, drawing, and sewing. Am I the right person to take this course? This course is appropriate for anyone who identifies as a mother or non-binary parent who wants to take their art (more) seriously — whatever that means to you. Writers, artists, and creatives in all disciplines are welcome. Whether you have one child or multiple, whether they are young or grown; whether you are a stay-at-home parent, a work-outside-the-home parent, or something in between/beyond; whether you have a partner or you’re single, you are welcome. You’ll also need a Facebook account and Zoom app. Past participants have included published writers and artists with gallery shows as well as creative hobbyists and crafters. This workshop will be most beneficial to someone who either already has some time to spend on the exercises, conversations, and creating, or someone who is willing to carve out this time and space. (We’ll talk early on about strategies for doing so.) While there is no minimum time commitment, I suggest starting out with at least one hour per week (either a block or broken up into smaller segments) dedicated to the materials and discussions. If you plan to participate in the live video chats or watch them later, figure in an additional hour. Of course, the upper limit of your time investment is really up to you and your circumstances. The regular price of this course is $300. However, this will be my second run through it, and I’m still looking for ways to make it the best it can be. To thank participants in advance for their feedback on this still-early version of the course, I’m offering it for just $149. That amounts to about $15 per week for thoroughly and thoughtfully crafted course material, supplemental links for further exploration, immediately useful and inspiring exercises, and smart conversation and community with others just like you. 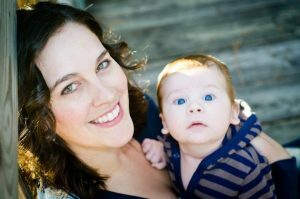 I created this workshop out of my own experience and to satisfy a lack in my own life as a new mother, and while I would have loved to find a course like this to take at that time, I also had limited financial resources. Because it’s so important to me to keep this course as accessible as possible, in addition to the reduced price, I’m offering two partial scholarships. I will also arrange an installment schedule for those who need it. Contact me for details at melaniekaysweeney@gmail.com. In order to create an intimate and engaged group, I limit this workshop to ten people. My desire is for everyone’s voice to feel heard and for our conversations feel spacious, democratic, and organic to our particular group. To ensure you get a spot, the earlier you sign up the better.